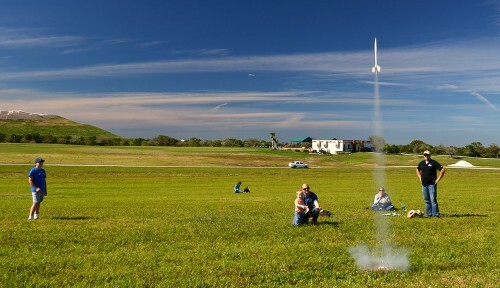 Grandson Malcolm needed to launch some rockets for a school science project. There’s something about the possibility of seeing something blow up that is deeply embedded in the Steinhoff genes (check out Dad blowing up a bridge), so Son Matt, Son Adam, Carly, and Grandsons Graham and Elliot assembled on what passes for a hill in South Florida – a landfill that has been turned into Dyer Park. Across-the-street-neighbor Cheyenne came along. She and her sisters practically live at Malcolm’s house, so she is almost an honorary Steinhoff by osmosis. These rockets aren’t the cardboard tubes that my buddies and I stuffed with gunpowder: the engines are made to produce consistent results. An Estes A8-3 engine, for example, produces eight seconds of thrust, pauses three seconds, then sends a blast out the other end of the engine to cause the nose cone to come apart, pulling out a parachute. Instead of an old-time fuse you lit with a match, these have electrical igniters to set off the explosives. That’s where I came in. When I climbed to the top of the hill, I found the launch team deep in contemplation after several failed launch attempts. When they said they had run connectivity tests to make sure there was loop current, I suggested that there might be juice present, just not enough. Of course, there was no spare battery. 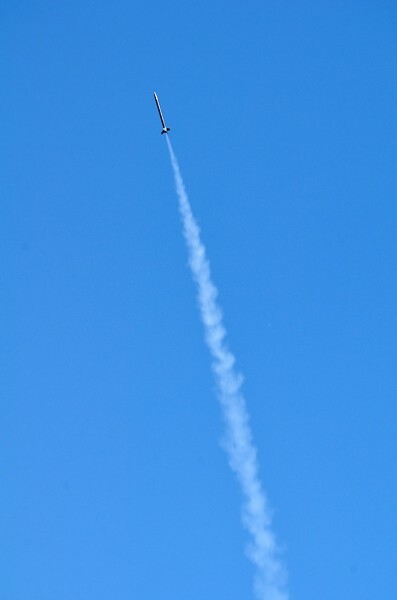 The white smoke in this photo was caused by a burning piece of wadded-up paper towel that served as wadding to protect the parachute when the backblast blew off the nosecone. 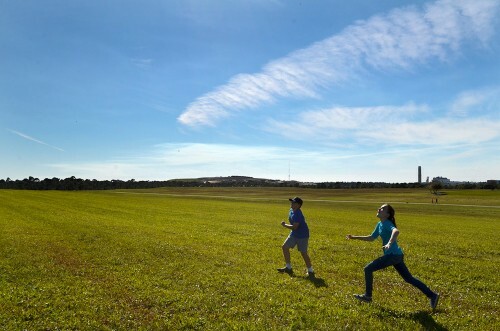 Malcolm and Cheyenne race to recover the falling rocket. Well, Cheyenne races to recover the rocket. Malcolm isn’t the kind of guy who feels the need to demonstrate his alpha maleness if it involves the exertion of energy. That’s another Steinhoff trait. Wife Lila informed me that Malcolm isn’t loafing: he’s conserving his energy for a soccer match. He didn’t want to take a chance on pulling a hamtwitchit or whatever it is that causes athletes to get carried off the field. That gal has serious wheels. She was great at getting under the rockets. After each launch, Malcolm would write down the stats recorded by a gizmo that blasted into space inside the rocket. It tracked all kinds of variables. For example, I’m pretty sure it was the rocket on the pad in the photo below that set the record for the day: 264 feet altitude; 83 mph top speed; 26.3 seconds of flight time. I saw a park ranger car pull over at the bottom of the hill. Somehow or another, I got the feeling that the ranger wasn’t there to enjoy the launch event. Sure enough, a very nice woman ranger came up and said that rocket launches weren’t allowed in the park “because the air space over the park” was controlled by a model radio-controlled club on another hill a tenth of a mile away. Matt explained the science fair project and said they needed to do three launches of three different rockets to get the results Malcolm needed, and there were just two more to go, with one rocket ready on the pad. She said to go for launch on the last two, then get out of there. After it was over, Matt said he had checked to make sure the FAA wouldn’t have problems with the location and altitudes, but he never thought they would run into a problem with “controlled air space” in a park sitting on top of gigatons of garbage. Y’know, if the Florida authorities won’t let you use their parks, there are plenty of wide-open, frozen lakes in Minnesota where you can launch rockets like that. I’ve done that, under the auspices of introducing my little sister to model rockets (many years ago). When I was a teacher at Trinity Lutheran School in Danville, IL, I started an after-school model rocket club. We’d launch them over at Kickapoo State Park. No authorities ever bothered us. We didn’t have as much wide-open space as is shown in your photos, so it could be tricky when one came down in a locust tree – the kind with the long, sharp spines. I presume you have those around Cape Girardeau. I’m not sure about Florida. I recall one boy who learned through his first rocket that the quality of work really does matter some times. But on the other hand, the rocket I most remember was the one that came down in flames – the wadding and engine were stuffed in too tight or something, and the glue and paint we used then apparently could burn really well. I don’t think that one went into the record books as a success, but it was one of the more exciting ones. Having been a model rocketeer at Central Junior High 1969 – 1970, I am intimately familiar with the whole kit and kaboodle. The A8-3 was the most popular rocket engine by far. The eight (8) in the engine model designation technically indicates it produces a guaranteed peak eight newtons of thrust. The total thrust impulse time is typically less that 0.8 second. The ejection charge, as you indicate will follow the thrust charge by three seconds. I learned a lot about aerodynamics, geometry, chemistry and rockets in general due to getting involved with a bunch of other guys interested in converting dollars into smoke and altitude. We even got airtime on KFVS and print in the Missourian. 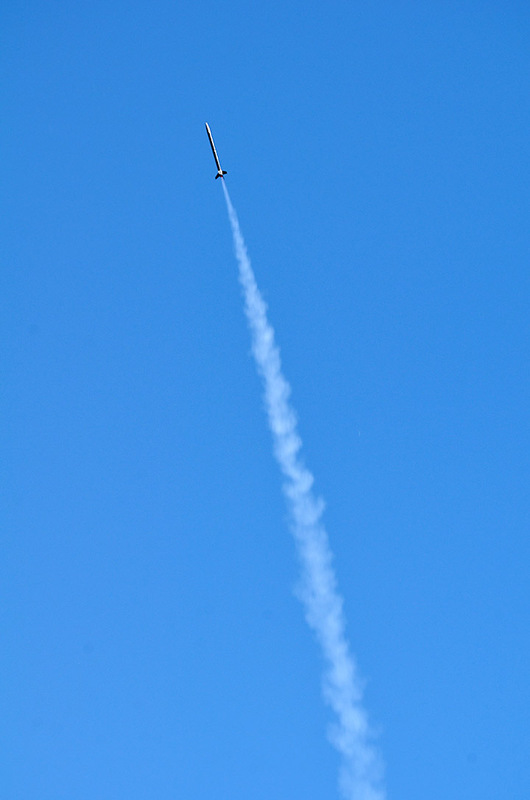 The highest altitude that I can remember one of our small rockets being tracked to was just over one thousand feet; 1110′. Was eyeballing a few kits at the AC Moore close to home here. Far cry from building and learning as these kits were ready to fly. (not the same as when Keith and myself messed with them back in the day) I guess marketing towards the instant gratification millennials. Oh my did that sound harsh? The official reason you can’t launch rockets is that they are ‘projectiles’ that leave the ground. Except that she was really nice, I would have argued that so are soccer balls, footballs and baseballs, all of which are allowed in the park. 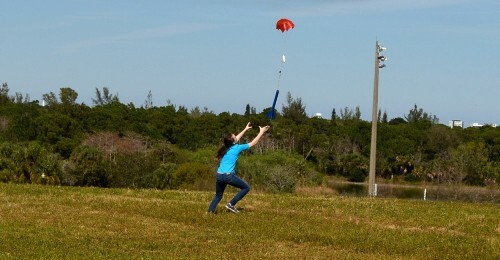 Our top model rocket moved at 80 mph with a very low mass. A typical baseball THROWN DIRECTLY AT A KID at 50 mph and five times the mass is substantially more dangerous. Not to mention the swinging stick the kid is carrying. 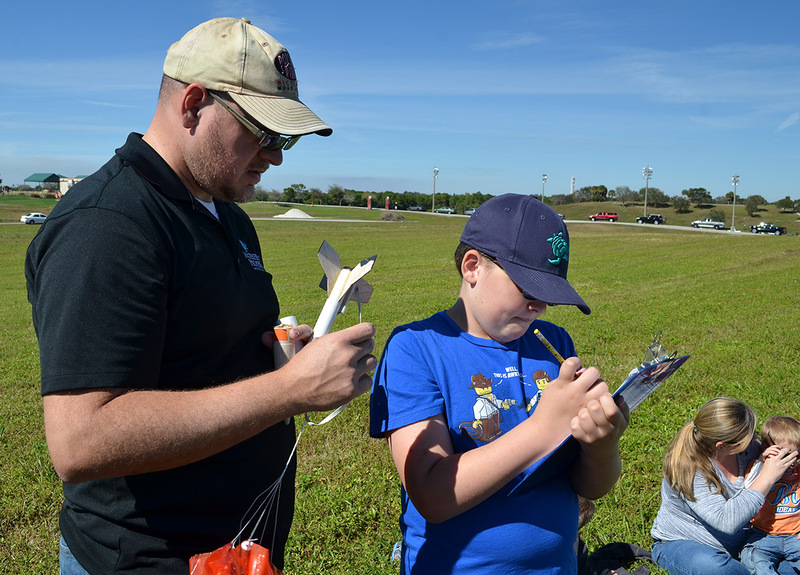 Model rockets are prohibited on all Palm Beach County public land and all public schools (GUNPOWDER!). These are the typical locations I’d think to launch because they have large, open spaces. 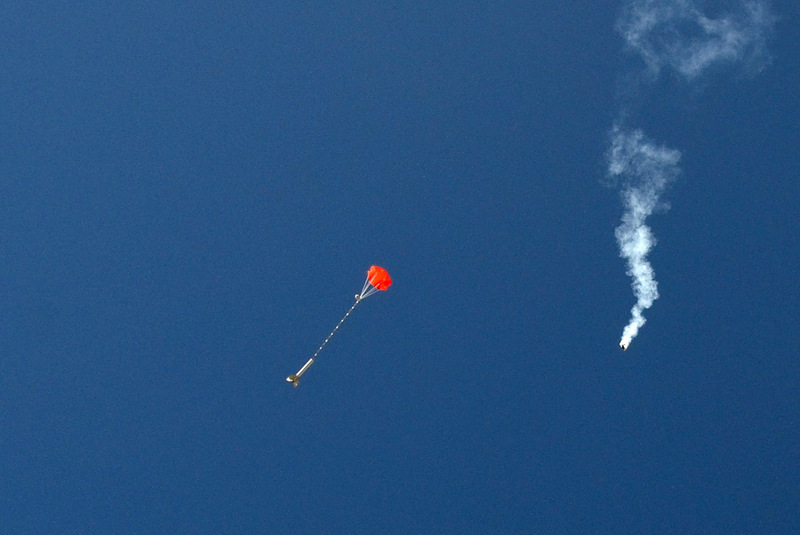 These prohibitions are common and amateur rocketry – at a time when space is experiencing a resurgence – is far less accessible than it has ever been. 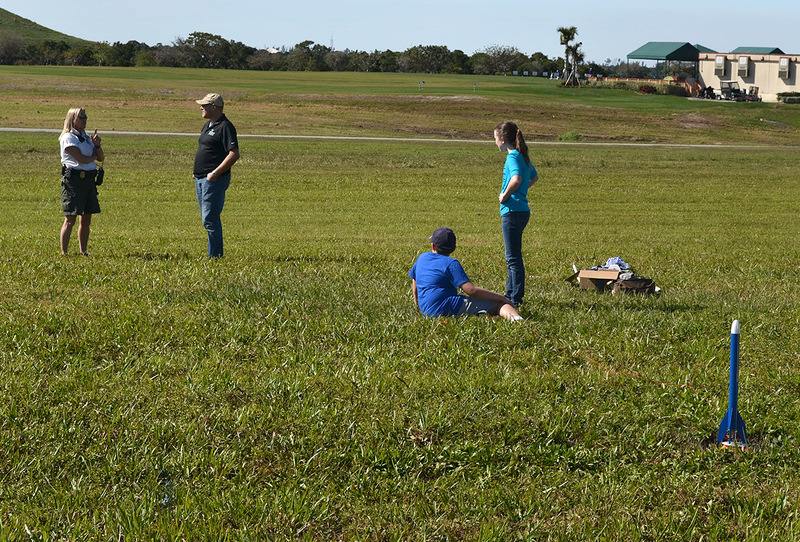 The model airplane club filled out all the paperwork, got a variance from the county and carries insurance. So, I guess I can’t be too mad at them. Still, I’m sad that folks are severely limited as to where they can launch rockets.